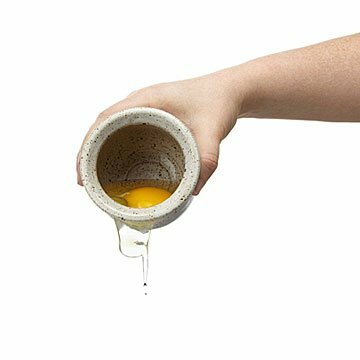 Bring homespun charm to your prep work with this stoneware egg white separator. Add a bit of homespun charm to your prep work with this charming stoneware design. Beautifully handmade with a light speckle finish, this rustic egg separator offers a smile-shaped spout to filter out whites for light meringues, while leaving the yolks in the bowl for your favorite dressings and desserts. Handmade by Karen and Stephen Steininger in Iowa. I thought this was so cut. Separating eggs yolks from egg whites can be so messy. This separator is so cute yet practical. It looks great but is a gift so I haven't used it. I used this when making Christmas cookies the other day. I needed two egg yolks so decided to try it. I ended up with a bit of a mess. When trying to pour out the whites, they ran down the outside, and the yolk almost escaped over the top. In fairness, this might take a bit of practice, and it may be better using just one egg at a time, which I will try next. I also bought one as a gift, and hope my friend has better luck. Right now I cannot recommend this, but will revisit when I have had more practice as it is very nice looking. This is such a superior product to all others I have purchased. Thank you for offering it! I loved showing it as well as using it. this product is so useful yet fun to look at too! Everyone is so amazed at how easy it is to use. A fun way to separate egg whites. Great look for a useful gift.